The S6 stereo headset comes in a classic white design that provides a comfortable fit. 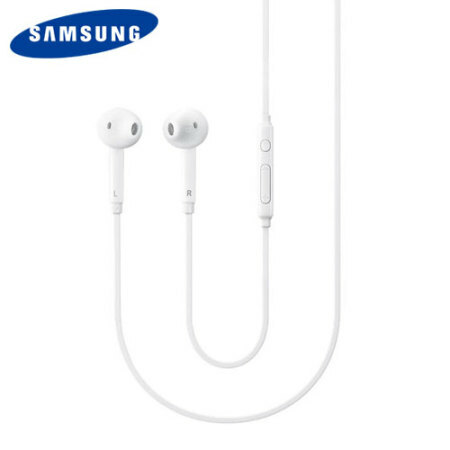 The official Samsung Galaxy S6 earphones also provide exceptional sound reproduction and enable you to handle calls handsfree thanks to the mic and volume controls. Got these to replace original set of Samsung headphones of the same model. The originals failed after about 5 months, the new ones failed after about 2 months. The latest replacements are still working after a week. Not sure if they'll see Christmas. Overall not impressed. Sound quality is good. Comfortable to wear. I finally found an earphone that truly fits my needs. I have been struggling to keep earphones in my ear during workout and running and have lost all hopes of using any when doing my activities. This earphone has good sound quality and finally something that won't fall off and fits my ear structure. I am very happy with this product. My sister and I have had the same problem with keeping earphones in place, so I would love to surprise her with this amazing product. The product was better than expected. Sound is very good considering the money spent. Great headphones for my Samsung Galaxy. Very pleased with them. Received my order today, took 3wks but im happy I've received it...love it! Thank you.?? The product was absolutely brilliant aswell as the delivery speed and time. Couldn't of got it from a better place! The product was absolutely brilliant aswell as the delivery speed and time. Couldn't of got from a better place!